So someone you know just got engaged. How wonderful for them! Do you just see dollar signs? 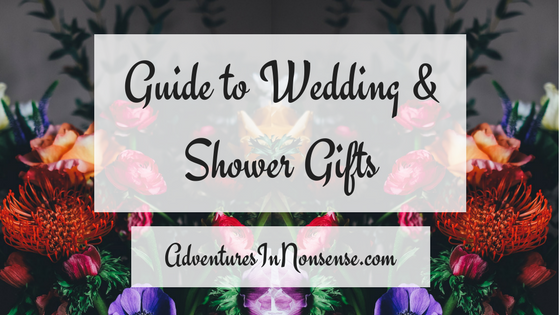 Gift giving for weddings and showers can be complicated and expensive! There are a few different categories of gift giving depending on the event, how close you are with the honoree, and your involvement in the overall event. For the most part, my gift guide will stick to monetary values, not specific things. There will be quite a few showers for a bride. Friends may throw one, family, coworkers, and even couples’ showers are a thing. 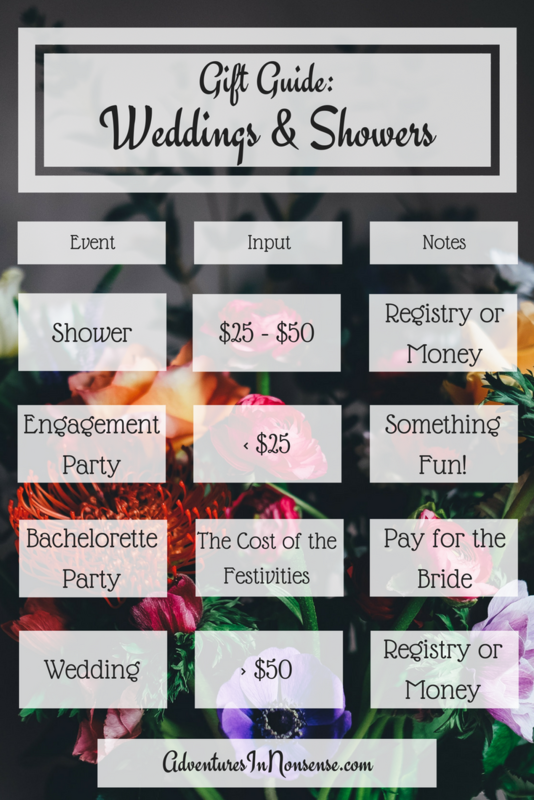 If you’re in the wedding, these showers can be expensive. Try and stick to the registry for showers. If you can’t, cash is always a nice gift. Couples go through creating a registry to let people know what they want. That’s really great that you LOVE your meat tenderizer, but maybe the bride and groom are vegan. When you receive an invitation to a party in honor of people, it’s really difficult to show up empty handed. One of my favorite recommendations for an engagement party is to bring “his and hers alcohol”. If the groom loves whiskey and the bride can’t say no to a bottle of wine, bring that as a gift! Maybe bring a bottle of champagne for them to share. Unless the Maid of Honor or party planner has specified a lingerie shower or something during the party, you don’t need to contribute a gift to the Bachelorette Party. You should, however, help contribute for whatever the cost of the bride is. It’s the new “thing” for Bachelorette Parties to turn into full trips. Between gas, hotels, meals, drinks, etc., it can get expensive for one person to shoulder the cost for herself and the bride. The big shebang! Gifts at a wedding generally should range about $50.00. Depending on your financial status or your closeness to the new Mr. & Mrs., this can vary. Again, go with the registry or cash. I know that sounds crass, but that’s really the gift that newlyweds need (or want at least). Don’t get overwhelmed when it comes to buying gifts for wedding festivities! One of my mom’s favorite things to do is to pick a “theme” for your gift: kitchen utensils, towels, pots…it’s pretty simple to get things when you have your theme. PRO TIP: Bed, Bath & Beyond coupons all have expiration dates on them. However, they never expire! And, the associates will generally work with you to make sure that you get the best discount for your purchase. Stock up on coupons!